Leading partners of the European automotive industry work together in the European research project DRIVE C2X to pave the way for the mass deployment of C2X technology and communication-enabled assistant systems. 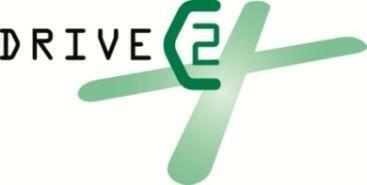 Within the context of DRIVE C2X, field operational tests are conducted at seven test sites all over Europe. Starting point for the project has been the forerunner-project PRE-DRIVE C2X, where multiple partners of DRIVE C2X were involved – just like Fraunhofer FOKUS. Fraunhofer FOKUS contributes in multiple aspects to the project. FOKUS develops C2X-based applications, is main developer of the HMI for cooperative applications, provides a laboratory test environment to validate applications functionalities and standard conform implementation of communication interfaces, and supports the execution of field operational tests with dedicated tools. The two applications developed by FOKUS are Slow Vehicle Warning and Emergency Vehicle Warning. Both application rely heavily on the efficient use of car to car communication. The slow vehicle warning will identify vehicles, which are driving in a unusual slow - and thus dangerous - way. Approaching vehicles or drivers will be warned at the right time to pay special attention to avoid safety-critical situations. Selected vehicles, such as police or emergency vehicles, are equipped with special rights – as they are today with the right to cross red lights in special situations. They are able to warn their environment with help of dedicated messages to make their operations more efficient and safer. Applications like these make use of the security modules, which are developed by FOKUS. All these applications and supporting tools are validated in the seven DRIVE C2X test sites.